There's a new meme going on over at Meet Me at Mikes. A different theme will be chosen each week, but this week's theme is On the Shelf. Bloggers are free to interpret it how they want and then link back to the original post. I encourage you to check out what others have done. As soon as I heard this week's theme, I knew I needed to shoot my Dad's shelf. 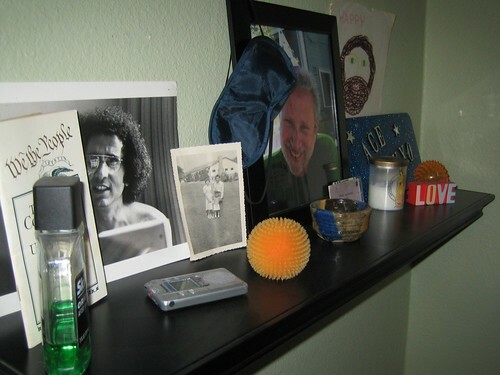 Dad passed away just over two years ago, and this shelf is a memorial to him. On it are mementos from his life, and our life together. Artwork I made for him as a kid, his aftershave, and the copy of the Constitution that he kept in his desk drawer because it meant so much to him. A lifetime on a shelf. I love your Dad's shelf. I know you miss him. I love you girl!